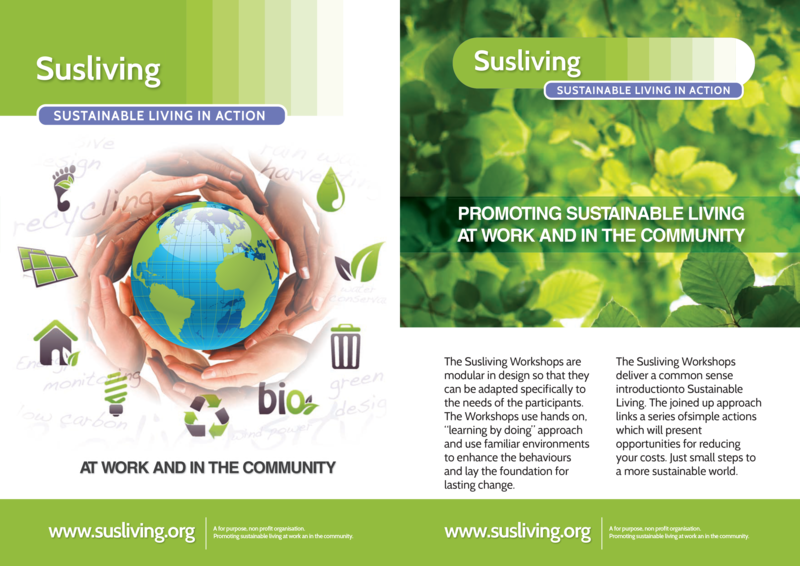 The Susliving Organisation was founded by a group of individuals with a diverse range of experience and expertise in sustainable living in Ireland and internationally. These individuals had many things in common but in particular they shared a common vision – a vision of a more sustainable way of living with the benefit of our advancing technologies. This vision would require change and would take time, but is a vision for the future that recognises today’s students as tomorrow’s decision makers. 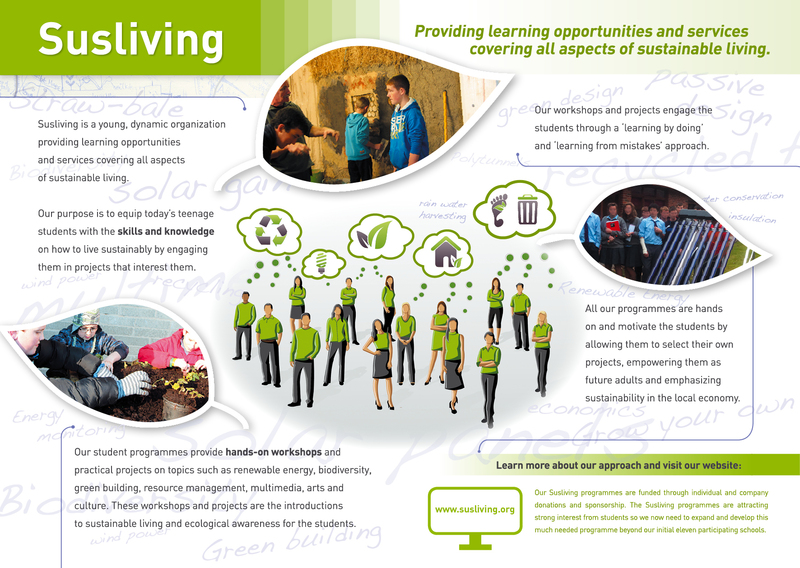 So Susliving was founded for the purpose of promoting and exploring ideas about sustainable living among second and third level students, and to follow their footsteps into the workplace and community. Susliving is a non profit organisation with charitable status. 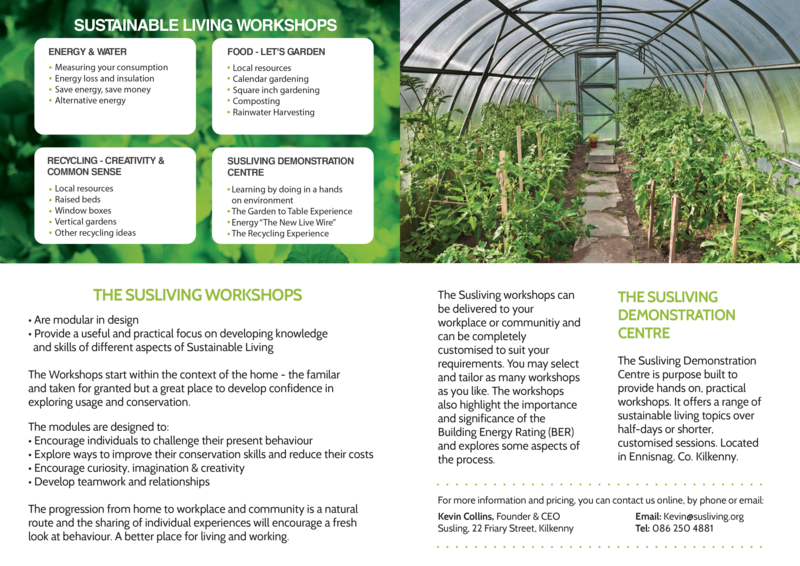 Susliving affords an opportunity for those interested to explore different perspectives of sustainable living and to develop those ideas in both local and global contexts. In 2012 we secured seed funding to roll out our Susliving Second Level Schools Programme to 11 pioneering schools. We continue to seek additional funding to continue our Workplace & Community Programmes. We have secured the services of coaching and technical mentors to support the Programmes online and through the delivery of Programme workshops. Susliving is unique in its structured support through the use of modern technology, access to technical expertise and its ongoing management and administrative support. Susliving has created a dedicated web presence to provide the students with an opportunity to explore and develop their ideas. The website offers access to resources of coaching and Technical Mentors to support students and their teachers. Our starting plan is based on an initial 5 year funding schedule. We intend to secure future funding that will enable the Susliving Programme to expand beyond the initial pioneering schools and into the future. Just small steps towards a more sustainable world. Energy and conservation in the school and/or the home. The efficient use of water. The use of energy technology, future trends and low level applications. Food production, nutrients, local produce. Waste management, composting and recycling. Local and durable construction materials without destroying habitats. Maximizing the health and wellbeing of those using the buildings. The fostering and care of local ecology/biodiversity. Cultural and artistic perspectives of sustainable living. The economics of sustainable living. The Susliving Programme also offers a unique opportunity to visit the Susliving Demonstration Centre where the various sustainable topics can be experienced and explained in a practical, hands on manner. To encourage the intended applied nature of the Susliving Programme, an open and completely flexible format for project submissions is promoted. This flexible format is intended to accommodate any project type and may include written, oral, visual or any other media or combinations of presentation formats. Stage One is the ideas generation phase involving Demonstration Centre days, workshops and site visits. Stage Two is the development stage of those ideas with Tech Mentors consultation. Stage Three will be the showcasing and promotion of the project via The Susliving Organisation, and the establishment of an ongoing maintenance and expansion plan. Susliving provides a network of Technical Mentors online, through the Demonstration Centre and through practical hands on workshops. These Tech Mentors are able to support and consult on projects chosen by participants in the Susliving Programmes. The Tech Mentors come from a wide range of backgrounds, with skills, experiences and interests in aspects of Sustainable Living. The variety of expertise is drawn from the fields of Engineering, Architecture, Design, Arts, Software Development, Construction, Horticulture, Business, HR and Economics. These mentors are providing their services to the project on a pro bono basis and without any vested commercial interest. Expertise: Finance & Business, Green Building. Expertise: Horticulture, Biology, Garden Design. Background: Biology & Horticultural Science. Likes: Sports, eating all the biscuits. Expertise: Sustainable Development, Shelter and Housing. Likes: Making stuff, tyres & plastics, pizza. Expertise: Environmental Science, Renewable & Alternate Energies. Background: Environmental Science & Environmental Governance. Expertise: Architecture, Construction, Green Building. Background: Architectural Engineering, Construction Management. Background: Ceramic & Fibre Artistry. Likes: The arts, creating things. Expertise: IT Ninja, being useful. Background: Computer Science, Audio Engineering. Expertise: Mininising waste, food sustainability. Click here to download our School brochure. Click here to download out Workplace & Community brochure. Click any of the quotes below to read the full testimonial. The project/programme is not an isolated concept, but one that encompasses cross-curricular, multidisciplinary teaching, education and activities. It should not mean more work, but more relevant and focused thinking. With a global, cross staff input, and student should be able to contribute meaningfully and constructively according to their individual skill or interest base. The fact that the ideas and projects are very hands-on for students means that the educational impact is far more meaningful and better remembered by those involved. We need to make great use of the broad range of expertise made available to us. They are obviously highly motivated and enthusiastic and very eager for schools to reap the benefits and as such, spread the benfits to our homes and wider community. Fantastic programme that helps establish the whole concept of sustainable living with students who in many cases have not experienced anything like this. The development of many cross-curricular activities with a school is endless. The mentors have provided an excellent resource for both teachers and students. Workshops have proved very successful and have engaged students and created an ongoing interest among them. The whole idea of starting small and taking on projects that can be achieved and can lead on to longer projects. This is something that will develop as a natural part of the school environment. The Susliving Schools Programme has invigorated and informed all staff and students who have been involved in it. Through the theoretical and practical exploration of sustainable life applications, students have developed life skills that will not only benefit them in the present tense, but will serve to lay the foundation stones of future sustainable, family and community life practices. (Eg. organic food production/cultivation of herbs/planting of a school orchard/establishment of raised bed/Insect Hotels/Birch Tree Walk amenity/creation of “Garden of Synergy” etc). In our first year we have focused on Biodiversity which has facilitated student involvement in exploring their current environment, the vegetative infrastructure, soil types the relationship between plants and insects and how we as a school community interact with this environment, and accordingly make informed choices about how to enhance it for the betterment of all. Adopting an action based pedagogy, students developed practical plant cultivation and caring skills and this “hands on” approach ensured an interest in their work and the project was sustained.They took ownership of the changes they had researched and planned under the guidance of their teachers. The programme was orchestrated curricularly through CSPE classes yr 1-3 and the Transition Year Programme were Environmental Studies and Horticulture classes are offered on a modular basis. Through organising a week of planned activities to celebrate National Tree Week, the invitation to participate in these changes was extended to all year groups who availed of the opportunities presented to them to participate in workshops, lectures, art competitions, planting activities and a school garden developmernt .This worked well and students enjoyed making effectual choices and changes about their environment. i) – Sourcing Funds for implementation of programme. ii) – The establisment of the Demonstration Site at Kings River, Ennisnag. iii)- The provision of excellent Technical Mentors to provide practical assistance and advice on how to put ideas into practice. iv) – Online support for schools. v) – Organisation of meetings between schools to share ideas and report on progress. vi) – Warmth, positivity and energy of Susliving Team! As we embark on a school remodelling programme we look forward to strengthening and reinforcing this strong relationship with the Susliving team and developing our skills and knowledge in this area in tandem with our staff and students ,to help us make informed choices about living practices, and help our school community to find the best sustainable way forward. Very interesting. A topic I knew little about in an integrated way has suddenly come to life. As a science teacher I would have been aware of aspects relevant to my subject but not the range of topics that are relevant to many other subjects. Very timely – possible sheet course for Junior Certificate. Only issue with this is that it may be consigned to one teacher. The idea of modules within several subjects would involve more staff. Looking forward to teasing this out with staff and expanding the programme. Teachers and students working together. 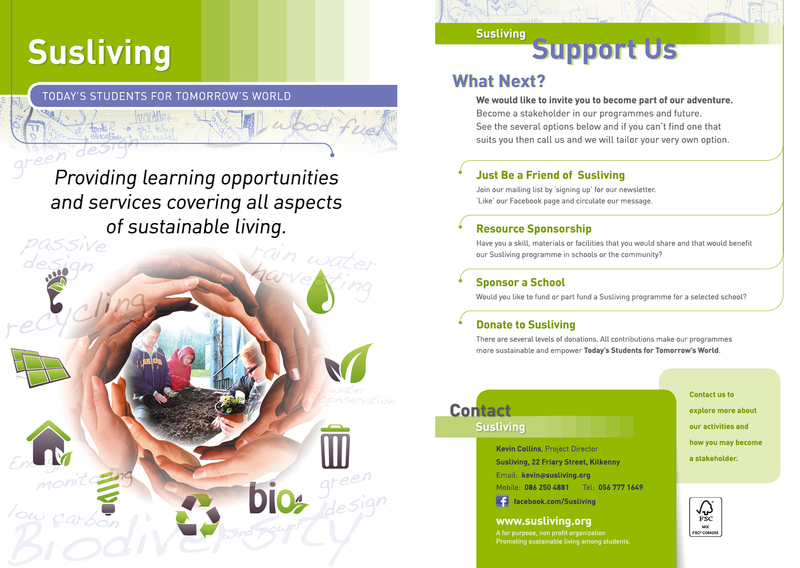 Susliving can be integrated into the whole school community and bring good practices into the greater community. Go maine sé céad! Huge uncertainty initially, but with a little persuasion and abundance of support it has been a worthwhile experience. Workshops have been hugely successful and many thanks to all the mentors involved. Hopefully we’ll encourage more members of staff to come on board in 2013 – 2014. There is an abundance of knowledge within Sligo Grammar School and I would like to tap into that. No idea what I’m going to do next year, time will tell! Thanks so much for all your help and support, we couldn’t have done it without you guys. If you have more questions we would be delighted to hear from you. The Susliving Organisation Ltd, 22 Friary Street, Kilkenny, Co. Kilkenny, Ireland.